A museum curator in a backwater Tennessee town stands accused of burglary and murder. Rumor has it that Lewis Wilder, curator of the Nolichucky Jack History Museum, is the Fox, a burglar with a taste for antiques. Maybe the tip-off is the anonymous $200 cash donation sent to the museum every month; maybe a stranger in a close-knit town just seems to fit the bill. Even Lewis’s love interest, bookseller Marilyn Wooten, has learned little of his past, and her uncle, the local sheriff, is always needling him about the burglaries. Lewis finally tells Marilyn that his parents were killed when he was a child and he was brought up by his wealthy Aunt Katherine, who lives nearby. When she insisted he become a doctor, he took off to find what he really wanted out of life, leaving his obnoxious cousin to butter her up. Things go from bad to worse when a loudmouthed car dealer with whom he had a very public argument is found dead after Lewis stops at his house on a trip to visit Aunt Katherine. 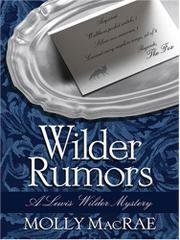 Lewis’s former best friend, now sheriff in his old hometown, considers him the prime suspect. Luckily for Lewis, his boyhood pal is willing to give him the benefit of the doubt while he searches for alternatives. An intriguing debut that holds the reader’s interest from start to finish.